if you use this Site, you are responsible for maintaining the confidentiality of your account and password and for restricting access to your computer, and you agree to accept responsibility for all activities that occur under your account or password. Budget Vapors and any and all of Budget Vapors parent and subsidiary companies only sell to smoking adults of legal smoking age, who own and can purchase with a credit card. If you are under the legal smoking age, www.budgetvapors.com and its affiliates will refuse service, terminate all of your accounts, remove or edit content, or cancel orders immediately. Please note that only one coupon code of any nature may be applied per order. We reserve the right to modify and alter errors after the fact. The entire content included in this site, including but not limited to text, graphics or code is copyrighted as a collective work under the United States and other copyright laws, and is the property of Budget Vapors and any and all of Budget Vapors parent and subsidiary companies. The collective work includes works that are licensed to Budget Vapors and any and all of Budget Vapors parent and subsidiary companies. Copyright 2014-2017, Budget Vapors ALL RIGHTS RESERVED. 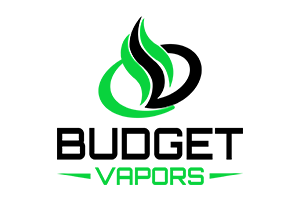 Permission is granted to electronically copy and print hard copy portions of this site for the sole purpose of placing an order with Budget Vapors or purchasing Budget Vapors products. You may display and, subject to any expressly stated restrictions or limitations relating to specific material, download or print portions of the material from the different areas of the site solely for your own non-commercial use, or to place an order with Budget Vapors or to purchase Budget Vapors products. Any other use, including but not limited to the reproduction, distribution, display or transmission of the content of this site is strictly prohibited, unless authorized by Budget Vapors. You further agree not to change or delete any proprietary notices from materials downloaded from the site. All trademarks, service marks and trade names of Budget Vapors and any and all of Budget Vapors parent and subsidiary companies used in the site are trademarks or registered trademarks of Budget Vapors and any and all of Budget Vapors parent and subsidiary companies. Anytime you send Budget Vapors and any and all of Budget Vapors parent and subsidiary companies an email, or log in on to our website at www.budgetvapors.com, you are communicating with us in an electronic format. This gives Budget Vapors and any and all of Budget Vapors parent and subsidiary companies the permission to communicate back to you in the same electronic format, either by e-mail or text written on our website. With this, we both mutually agree that any contracts, agreements, disclosures or notices, or any other communication that is provided to you by Budget Vapors and any and all of Budget Vapors parent and subsidiary companies satisfies all legal notification requirements. Export Control Laws: Visitor or user access to www.budgetvapors.com is governed by all applicable federal, state, and local laws. All information available on www.budgetvapors.com is subject to U.S. export control laws and may also be subject to the laws of the country where you reside. This site and the materials and products on this site are provided "as is" and without warranties of any kind, whether express or implied. To the fullest extent permissible pursuant to applicable law, Budget Vapors and any and all of Budget Vapors parent and subsidiary companies disclaim all warranties, express or implied, including, but not limited to, implied warranties of merchantability and fitness for a particular purpose and non-infringement. Budget Vapors and any and all of Budget Vapors parent and subsidiary companies do not represent or warrant that the functions contained in the site will be uninterrupted or error-free, that the defects will be corrected, or that this site or the server that makes the site available are free of viruses or other harmful components. Budget Vapors and any and all of Budget Vapors parent and subsidiary companies do not make any warrantees or representations regarding the use of the materials in this site in terms of their correctness, accuracy, adequacy, usefulness, timeliness, reliability or otherwise. Some states do not permit limitations or exclusions on warranties, so the above limitations may not apply to you. All items purchased from www.budgetvapors.com or from Budget Vapors and any and all of Budget Vapors parent and subsidiary companies or sales/distribution agents are made pursuant to a shipment contract. This means that the risk of loss and title for such items pass to you upon delivery to the carrier. Budget Vapors and any and all of Budget Vapors parent and subsidiary companies products, this Site and all information, content, materials, products, software and services included on or otherwise made available to you through this Site are provided by www.budgetvapors.com or its affiliates on an "as is" basis, unless otherwise specified in writing. www.budgetvapors.com and its affiliates make no representations or warranties of any kind, express or implied, as to the products or the operation of this Site or the information, content, materials, products, software or services included on or otherwise made available to you through this Site, unless otherwise specified in writing. You expressly agree that your use of budget vapors and any and all of budget vapors parent and subsidiary companies products as well as any third party products or this Site is at your sole risk. To the full extent permission by applicable law, Budget Vapors and any and all of Budget Vapors parent and subsidiary companies and www.budgetvapors.com and its affiliates disclaim all warranties, express or implied, including, but not limited to, implied warranties of merchantability and fitness for a particular purpose. Budget Vapors and any and all of Budget Vapors parent and subsidiary companies and www.budgetvapors.com and its affiliates do not warrant that Budget Vapors and any and all of Budget Vapors parent and subsidiary companies products; this Site; information, content, materials, products, software, or services included on or otherwise made available to you through this Site; their; or email sent from www.budgetvapors.com are free of defects viruses or other harmful components. Neither Budget Vapors and any and all of Budget Vapors parent and subsidiary companies nor www.budgetvapors.com and its affiliates will not be liable for any damages of any kind arising from the use of Budget Vapors and any and all of Budget Vapors parent and subsidiary companies products, this Site or from any information, content, materials, products, software or services included on or otherwise made available to you through this Site, including but not limited to direct, indirect, incidental, punitive, and consequential damages, unless otherwise specified in writing. Budget Vapors parent and subsidiary companies are not liable for any damages that result from products such as chargers, atomizers, mechanical mods, batteries, or any other electronics that are used in conjunction with these products. Furthermore, consequential and incidental damages are not covered under this warranty. For lithium batteries, we cannot control the way they will be used, charged, discharged or stored after purchase, Budget Vapors parent and subsidiary companies offers no warranty to lithium battery/batteries or any type of rechargeable batteries, separate or contained within the device, other than the battery working correctly upon first charge. We are not responsible for any damages for any type of batteries due to the cause of usage or short-circuited. Please make sure that you understand how lithium and rechargeable batteries as well as devices that contain lithium rechargeable devices work. Use them at your risk. These products contain a chemical known to the state of California to cause cancer and birth defects or other reproductive harm. Certain state laws do not allow limitations on implied warranties or the exclusion of limitation of certain damages. If these laws apply to you, some or all of the above disclaimers, exclusions, or limitations may not apply to you, and you might have additional rights. Budget Vapors and any and all of Budget Vapors parent and subsidiary companies reserve the right to change any and all content contained on this Site at any time without notice. Taste is subjective. You may not return e-liquid, liquid products, opened cartridges, powders, crystals, or DIY ingredients for hygienic reasons and therefore it is Non-Refundable. All sales are final, Once a purchase is made it cannot be canceled. In the event of a cancellation store credit will be issued. Rechargeable batteries are NON REFUNDABLE if opened or used. Please note that we may request for you to email/send pictures of damaged or defective merchandise prior to sending the items back. We may also email you with troubleshooting steps in an attempt to save you the time of returning the items. Returns are handled on a case-by-case basis and authorized at our discretion. Customers may return UNOPENED and UNUSED items for store credit, within 7 days of purchase. Customers will be responsible for shipping the product back to us. Shipping charges are NON REFUNDABLE/Creditable. Returns/exchanges will incur a 20% Restocking Fee on unopened/unused items. Important: Once you have been approved for a return, you have 7 days to return the item(s) after 7 days we are unable to take the item back. Orders are processed within 1 to 3 business days after cleared payment. If you place your order over the weekend (Friday through Sunday), please allow extra time to process your order. This estimate does not include the actual shipping times. Our shipping schedule may vary slightly during extremely busy times such as sales events and during the holiday season. Please make sure you are fully aware of your country’s laws regarding e-liquid/e-cigarette importation before making a purchase. Although we do ship to almost every country in the world, Budget Vapors will not be held responsible for orders seized by customs or other law enforcement. Budget Vapors is unaware of the current laws and regulations outside of the United States. The buyer is subject to currency exchange fees and will assume all risk associated with their international purchase. In the event that a Budget Vapors and any and all of Budget Vapors parent and subsidiary companies product is mistakenly listed at an incorrect price, Budget Vapors and any and all of Budget Vapors parent and subsidiary companies reserve the right to refuse or cancel any orders placed for product listed at the incorrect price. Budget Vapors and any and all of Budget Vapors parent and subsidiary companies reserve the right to refuse or cancel any such orders whether or not the order has been confirmed and your credit card charged. If your credit card has already been charged for the purchase and your order is cancelled, Budget Vapors and any and all of Budget Vapors parent and subsidiary companies shall issue a credit to your credit card account in the amount of the incorrect price. These terms and conditions are applicable to you upon your accessing the site and/or completing the registration or shopping process. These terms and conditions, or any part of them, may be terminated by Budget Vapors and any and all of Budget Vapors parent and subsidiary companies without notice at any time, for any reason. The provisions relating to Copyrights, Trademark, Disclaimer, Limitation of Liability, Indemnification and Miscellaneous, shall survive any termination. Budget Vapors and any and all of Budget Vapors parent and subsidiary companies may deliver notice to you by means of e-mail, a general notice on the site, or by other reliable method to the address you have provided to Budget Vapors and any and all of Budget Vapors parent and subsidiary companies. Harassment in any manner or form on the site, including via e-mail, chat, or by use of obscene or abusive language, is strictly forbidden. Impersonation of others, including a Budget Vapors and any and all of Budget Vapors parent and subsidiary companies or other licensed employee, host, or representative, as well as other members or visitors on the site is prohibited. You may not upload to, distribute, or otherwise publish through the site any content which is libelous, defamatory, obscene, threatening, invasive of privacy or publicity rights, abusive, illegal, or otherwise objectionable which may constitute or encourage a criminal offense, violate the rights of any party or which may otherwise give rise to liability or violate any law. You may not upload commercial content on the site or use the site to solicit others to join or become members of any other commercial online service or other organization. Budget Vapors and any and all of Budget Vapors parent and subsidiary companies does not and cannot review all communications and materials posted to or created by users accessing the site, and is not in any manner responsible for the content of these communications and materials. You acknowledge that by providing you with the ability to view and distribute user-generated content on the site, Budget Vapors is merely acting as a passive conduit for such distribution and is not undertaking any obligation or liability relating to any contents or activities on the site. However, Budget Vapors and any and all of Budget Vapors parent and subsidiary companies reserves the right to block or remove communications or materials that it determines to be (a) abusive, defamatory, or obscene, (b) fraudulent, deceptive, or misleading, (c) in violation of a copyright, trademark or; other intellectual property right of another or (d) offensive or otherwise unacceptable to Budget Vapors and any and all of Budget Vapors parent and subsidiary companies in its sole discretion. You agree to indemnify, defend, and hold harmless Budget Vapors and any and all of Budget Vapors parent and subsidiary companies, its officers, directors, employees, agents, licensors and suppliers (collectively the "Service Providers") from and against all losses, expenses, damages and costs, including reasonable attorneys' fees, resulting from any violation of these terms and conditions or any activity related to your account (including negligent or wrongful conduct) by you or any other person accessing the site using your Internet account. In an attempt to provide increased value to our visitors, Budget Vapors and any and all of Budget Vapors parent and subsidiary companies may link to sites operated by third parties. However, even if the third party is affiliated with Budget Vapors and any and all of Budget Vapors parent and subsidiary companies, Budget Vapors and any and all of Budget Vapors parent and subsidiary companies has no control over these linked sites, all of which have separate privacy and data collection practices, independent of Budget Vapors and any and all of Budget Vapors parent and subsidiary companies. These linked sites are only for your convenience and therefore you access them at your own risk. Nonetheless, Budget Vapors and any and all of Budget Vapors parent and subsidiary companies seek to protect the integrity of its web site and the links placed upon it and therefore requests any feedback on not only its own site, but for sites it links to as well (including if a specific link does not work). Budget Vapors and any and all of Budget Vapors parent and subsidiary companies will not be held responsible or liable for any injury, damage, or defect, permanent or temporary that may be caused by the improper use of a Li-ion (Lithium-ion), LiPo (Lithium-ion Polymer) and any rechargeable battery/batteries. Please have a basic understanding of the batteries you are using and how to care for them properly. NOTE: Use special caution when handling batteries. Do not use any battery if visible signs of damage or stress is present. Always store and transport your batteries in a non-conductive container. Always charge batteries on a fire-proof surface. Never charge batteries unattended. Do not modify your batteries or chargers in any way, shape, or form. Use of batteries without a protection circuit is potentially hazardous. By purchasing batteries you acknowledge these risks and attest that you have sufficient understanding of the batteries you are purchasing to use and care for them properly. These products are not intended to diagnose, treat, cure or prevent any disease. Information and statements made are for educational purposes and are not intended to replace the advice of your health care professional. By purchasing these products, you agree to use products at your own risk. Under no circumstances will Budget Vapors and any and all of Budget Vapors parent and subsidiary companies be held responsible or liable, directly or indirectly, for any loss or damage that is caused or alleged to have been caused in connection with use of, or reliance on any product on this site. Our products are intended for ADULTS only. Our products are not to be used by anyone under the legal smoking age of the state they reside in. Other Groups that should consult a physician before use Included (but are not limited to): Those who suffer from heart disease or high blood pressure. Pregnant, nursing, or those thinking of becoming pregnant. Those allergic to nicotine or other PG based products. Budget Vapors products may contain chemicals known to the State of California to cause cancer, birth defects, or other reproductive harm. Our products are not smoking cessation products and have not been tested as such. Our products are intended for use by adults of legal smoking and vaping age in their relevant jurisdiction, and not by children, women who are pregnant or breastfeeding, or persons with or at risk of heart disease, high blood pressure, diabetes or taking medicine for depression or asthma, or who otherwise may be sensitive to nicotine. Nicotine is addictive and habit forming, and it is toxic by inhalation, in contact with the skin, or if swallowed. Ingestion of the non-vaporized concentrated e-liquid ingredients can be poisonous. Keep away from children and pets. If ingested, immediately consult your doctor or vet. Our e-liquid products have not been evaluated by the Food and Drug Administration nor are they intended to treat, mitigate, prevent or cure any disease or condition. USE ALL PRODUCTS ON THIS SITE AT YOUR OWN RISK!